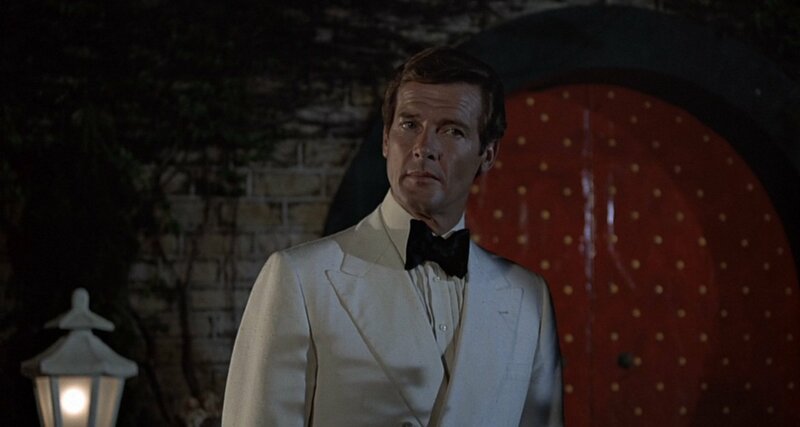 Roger Moore wears his first of three off-white dinner jackets in The Man with the Golden Gun. This dinner jacket is very close to being white, though it’s still not quite there. And fitting for the Asian setting, this dinner jacket is made from a slubby but luxurious dupioni silk. The cut is Cyril Castle’s classic double-breasted six button with two to button and has a narrower wrap. The shoulders narrow and gently padded. The jacket has double vents and the pockets are slanted and jetted. The cuffs button one with a turnback detail and don’t have the link button feature that Roger Moore wears on his other suits in the film. The black trousers are gently flared with a darted front and a black satin stripe down each leg. Instead of the usual white shirt, Moore wears a cream silk crepe de chine dress shirt by Frank Foster. It’s unclear whether he is wearing that colour shirt to make a fashion statement, to match the colour of his dinner jacket or simply because it flatters his complexion better than a stark white. Most likely he’s wearing it because it’s the colour of silk and he likes the luxury of silk. The shirt has a spread collar, a pleated front with standard mother of pearl buttons down the placket and two-button cocktail cuffs. The placket is stitched close to the centre to give focus to the middle of the shirt. Moore wears a wide, black satin bow tie to match the wide lapels. Though the bow tie looks dated, wide lapels on a double-breasted jacket don’t so much since they are typically wider than single-breasted lapels anyway. Moore’s dress shoes are black patent slip-ons with a strap and clasp detail. A real favourite of mine. Just a pity it’s so fleetingly used in the film. I assume the buttons on the jacket itself are mother of pearl and I have to admit I never noticed the shirt was cream rather than white. Well done, (as usual) Matt. Sad to think that with the direction of the current movies and their star that this look will, most likely, never be seen again in Bond’s world. Couldn’t agree more. 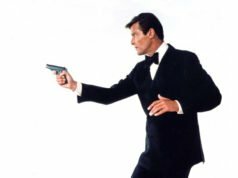 It’s too bad Bond hasn’t worn either a double-breasted jacket or a white dinner jacket since Moore left the part. Especially considering how great such an outfit would have looked on Craig’s complexion. As for DB jackets, please someone bring them back on screen. 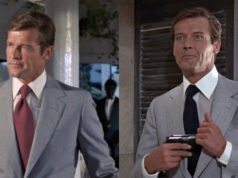 I can’t remember Sir Roger Moore or George Lazenby looking bad or dated in one of them. Pierce Brosnan wore a double-breasted Brioni blazer in Goldeneye that I like, nice reminder of 007’s naval heritage, but I don’t believe he’s worn a double-breasted jacket since then, overcoats excepted. I didn’t mention it since he left it open, which wasted the good look of the outfit to me. Still, I enjoyed the idea and Brosnan’s style in general. Would have been better if it were a 6×2, as well. Brosnan’s blazer indeed was a 6×2. 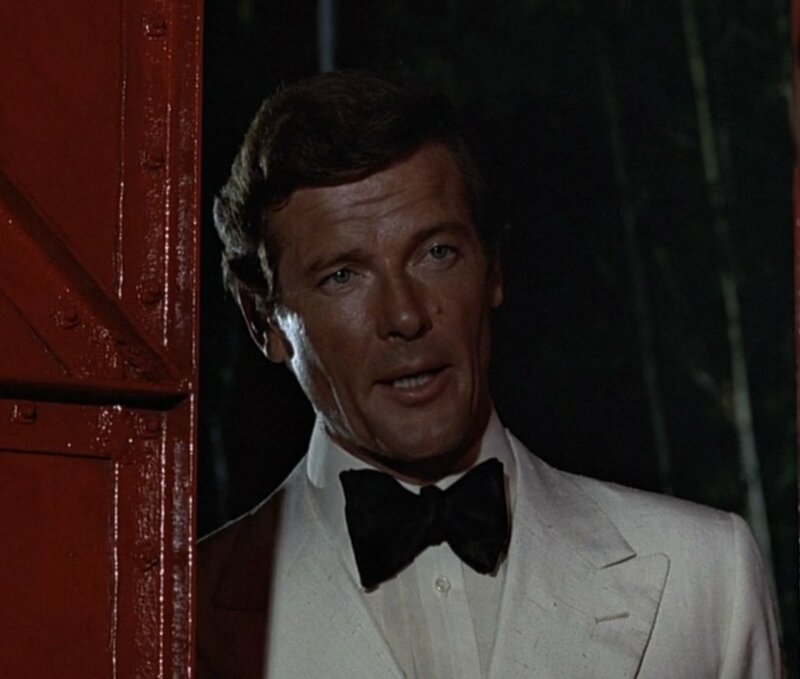 A classic Sir Roger outfit I really like (besides the, in my opinion, over sized bow tie). 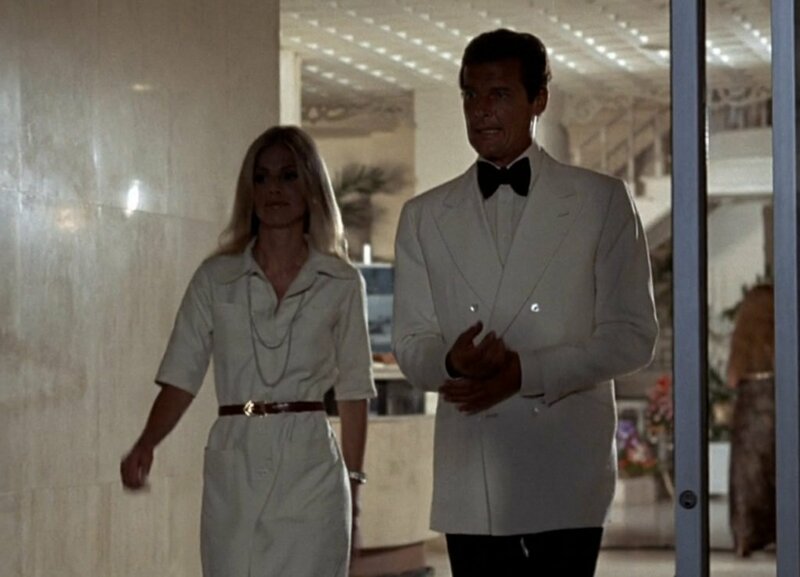 However, I prefer his other white dinner jackets in OP and AVTAK. To be honest I also prefer both of Connery’s before this one. Just a matter of personal taste I guess. By the way, is it ok to have covered/dressed buttons on a white dinner jacket? I don’t think there’s anything wrong with covered buttons, but well-dressed men in film just about always chose mother-of-pearl or other light-coloured buttons buttons. So long as they don’t make the mistake of facing the lapels and pocket jettings in white silk, as some do. If there are covered buttons, I would rather it be the same fabric as the rest of the jacket. Personal opinion of course. Switch out the bow tie for something narrower (it dates this outfit the most) and it would look great. I think a 4×2 might look a little more classic, however. 6×2 dinner jackets remind me of 2 or 3 button ones, which are considered passé by informed dressers. I like this one too. I think Moore looks very good in The Man With the Golden Gun.